Sailor Moon Collectibles has the scoop on information about the Sailor Moon artbook. We haven’t heard much about this book since the original announcement at New York Comic Con last October and though there were a lot of answers that weren’t really answers, here’s what we’ve learned from Kodansha Comics USA. The art books will all be printed in Japan and distributed around the world. We previously learned that they would be sold in seven countries, which includes Japan and the United States but we still don’t know what those five other countries are. We have learned that each country will have it’s own unique bonus materials meaning it will be quite expensive for completists to get every last one if they want all of the bonus content. 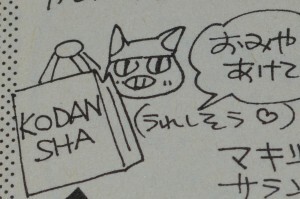 The Kodansha Tumblr page will be having a giveaway tomorrow, May 1st. Prizes, which will include Sailor Moon merchandise, will be manga, pins, calendars, posters and more. Keiko Kitagawa, the actress who played Sailor Mars in the live action Sailor Moon show, will be releasing a new photo book to celebrate her first 10 years in the fashion industry. The book is set to be released on her 27th birthday, August 22nd of this year. She was recently in Paris to get photos for her book and has now returned to Japan to finish up with more photos. Keiko Kitagawa now has an official Facebook page where you can see many photos she took while in Paris working on her photo book. She also recorded a video which is talking about the new book. It’s in Japanese but well worth watching if like me you’d watch her read the phone book. The Bluefin Tamashii Nations USA Facebook page has posted some new information about Bandai’s new S. H. Figuarts Sailor Moon figure. They specify the North American sale time to be in August or September. The MSRP is $42.99, pretty much equivalent to the Japanese price we saw earlier. It is also mentioned that the two new face we recently saw, that being the winking and crying Sailor Moon faces, will be 1st edition exclusives. 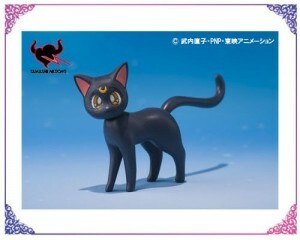 Additionally the Luna figure which accompanies Sailor Moon is also a 1st edition exclusive. Online store G. G. Infinite already has the figure up for pre-order. The cost on their site is $42.29 and they mention the figure will be released in September. Following last week’s post about a potential delay in the airing of the new Sailor Moon series we have received more specific confirmation from Fumio Osano, editor of the Sailor Moon manga, that the new Sailor Moon anime originally scheduled to air this summer is delayed. There has still been no official announcement and there are no specifics as to the extent of this delay, but this does seem to indicate that the show will not be released on it’s original schedule. As always I want to stress that nothing is official but given this is coming from Fumio Osano who was involved in the original announcement, it should be considered to be more than a simple rumour. The tweet that Fumio Osano, @osabu8 on twitter, made to confirm was simple. A user asked “Please confirm. 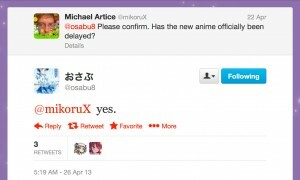 Has the new anime officially been delayed?” and he simply said “yes.”. Further to this another user asked if it would indeed be broadcast in Winter 2014 as we’ve heard, to which his answer was “not 2014.perhaps.“. I have no way to properly determine the full meaning of this comment. It could mean that it is delayed but not until 2014. Fumio Osano is not a fluent English reader or writer so all of this information is subject to errors in translation. 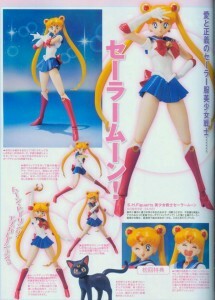 A lot of new pictures of the upcoming Sailor Moon S. H. Figuarts figure by Bandai have surfaced. The figure is featured in the June issue of Dengeki Hobby Magazine’s. Sailor Moon Collectibles has been sharing many new pictures of the figure as they come in on their web site and Facebook page. 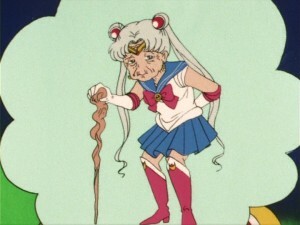 The faces we’ve seen to date include a normal Sailor Moon face, a crying face and a winking face. The normal face is seen with and without a Tiara, but since only three faces are mentioned on the web site that may indicate that the Tiara is removable from the one face, or from all of them. It may come attached to the front piece of hair based on my best guess at how the faces are held in place, but this is just speculation. Keep reading for a few more lower quality photos of some magazine pages. Anime North has announced two new guests Katie Griffin, the voice of Sailor Mars, and Susan Roman, the voice of Sailor Jupiter. 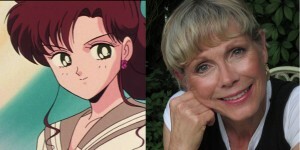 They will join Linda Ballantyne, the voice of Sailor Moon, and John Stocker, voice director for Sailor Moon, at this year’s convention which will be held in Toronto the weekend of May 24th to the 26th. Susan Roman is a veteran voice actor with a ton of credits to her name. She provided the voice of Lita, Sailor Jupiter, for her entire time in the series making her the only actress to voice one of the main Sailor Scout for the entire length of the series. Katie Griffin has also done a great deal of voice acting. We met up with her at Fan Expo last year. Check out that interview. 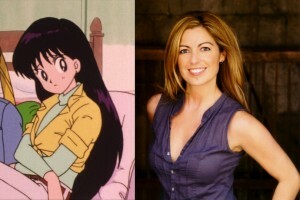 She provided the voice of Raye, Sailor Mars, for all but 16 episodes of the series making the actress appearing in the most episodes of the show. With all of these Sailor Moon actors at the same convention we will be in attendance and hope to see you there. Weekend passes are sold out but individual passes are still available for all days. 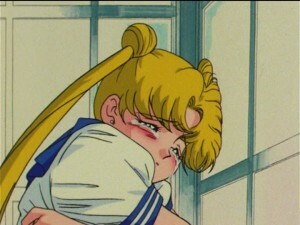 Although there has still been no official announcement confirming this there is growing evidence that there could be a delay in the release of the 2013 Sailor Moon anime which was originally meant to be released this summer. The main sources for this are a tweet from Fumio Osano, the Sailor Moon manga’s editor, word from Toru Furuya, the voice of Tuxedo Mask, and word from a European distributor for Sailor Moon. Once again there is currently no official confirmation of a delay, but as there is growing evidence that this could be happening we are presenting you with all of the evidence that exists at this time and what those sources are so that you can make your own informed opinion as to what this means. Update: This shirt sale has been delayed to April 22nd, not the 8th as originally reported. You have plenty of time to save up $12 in two weeks! 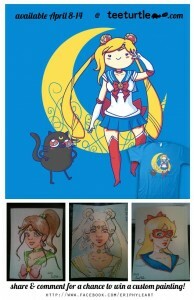 Starting Monday April 22nd this very cool “Adventure Moon” shirt which has Sailor Moon and Luna drawn in the style of Adventure Time will be sold at Tee Turtle. Tee Turtle works a bit differently from other t-shirt sites. The shirt will be on sale for $12 on Monday and then for $15 until April 28th, so pick it up on Monday if you can but if you miss it you’ll still have a chance to get it until the end of the week. Moon Tiara Action! These new photos of Bandai’s Sailor Moon figure which will be released in August give us a first look at the Tiara in action! 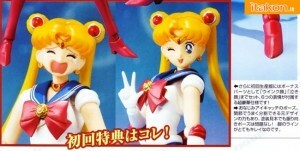 Notice also that Sailor Moon in this pose does not have her Tiara on her forehead, as this is a swappable face. Along with three new photos the Tamashii site also has an English blurb about the toys which reveals that there will be two Moon Sticks, one with the Silver Crystal and one without. 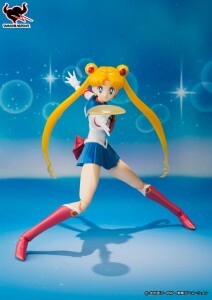 S.H.Figuarts Sailor Moon’s Posability & Articulation! 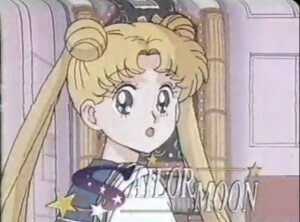 Intense action scenes highlight Sailor Moon’s image as a “Beautiful Soldier”. 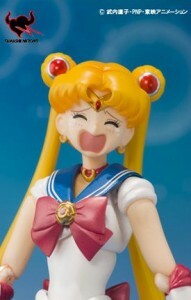 The latest S.H.Figuarts articulation technology lets you fully enjoy the world of Sailor Moon. You can recreate iconic action scenes of Sailor Moon from memory with your very own hands. That is one of the greatest attractions of playing with action figures. Part of the hair has been rendered with clear parts for enhanced realism. 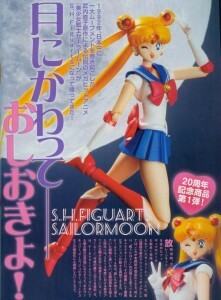 S.H.Figuarts Sailor Moon will shine not only as an articulated action figure but as an elegant display piece. A full array of interchangeable faces and hands in the set help reproduce dynamic anime scenes. Also, 2 types of Moon Sticks (with/without Silver Crystal), and effect parts for “Moon Tiara Action” will expand the playability of “S.H.Figuarts Sailor Moon”. Next time, we will be able to introduce not only serious facial expressions but also comical expressions of Sailor Moon. Earlier this week Toei Animation announced that it made a deal with Viz Media Europe for the release of the Sailor Moon anime in German and French language DVDs. The entire 200 episode TV series will be released by Viz Media Switzerland in German DVDs which will have both German dialogue as well as the original Japanese dialogue with German subtitles. The French release will be handled by Kazé who will be releasing the entire first season of Sailor Moon on bilingual DVDs featuring the French dub as well as the original Japanese with French subtitles. German and French speaking fans may want to think about picking up these releases as there are still no English dubbed or subbed DVDs currently in print. Below you will find a few samples of the French language dub. Keep in mind that I recorded these from VHS taped versions of a TV broadcast from the 90s so these clips should not be taken as an indication of the video quality of these upcoming releases.